commonly known as the Kelp Crab, Northern Kelp Crab, and the Shield-Backed Kelp Crab. Crabs appeared in the fossil record early in the Jurassic period of the Mesozoic, which is nearly 200 million years ago. Through the record, crabs seem to continue to shorten the body and reduce the abdomen. Of the living species of crabs that have been described, the cephalothorax is a defining characteristic. This is the fusion of head and thorax, covered by the carapace. The cephalothorax is short and broad, and forms practically the whole body. 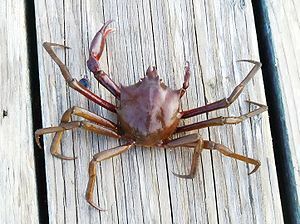 The Brachyura or “short-tailed” crabs, have an abdomen that has been reduced to a thin, flat plate, tucked forward out of sight below the cephalothorax. They tend to have five pairs of head appendages. 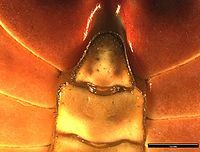 These include the first and second antennae and the innermost three pairs of mouthparts; the mandibles and the first and second maxillae. 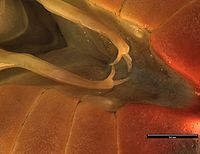 The eight pairs of thoracic appendages include the outermost three pairs of mouthparts (the first, second, and third maxillipeds) and the five pairs of walking legs. 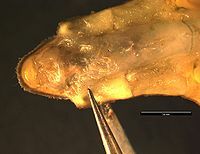 The first pair of the walking legs are modified as chelipeds or pincers. P. producta is found in the subtidal to 73m from Prince of Wales Island (Alaska) to Punta Asuncion (Baja California). 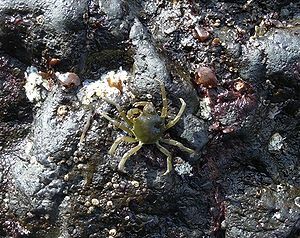 The young crabs are common among rocks or on the brown alga Egregia. In the winter the crabs can be found in the low intertidal zone on pilings, floating docks, and rocky shores of protected outer coasts. In summer, the older crabs migrate to floating kelp like Macrocystis. Crabs often show marked sexual dimorphism. Aside from generally size differences between the sexes, the form of the pleon or abdomen is different from males and females. In most males, the pleon has a narrow and triangular form. In females, the pleon is rounded and broad. This is due to the fact that female crabs brood fertilized eggs on their pleopods. 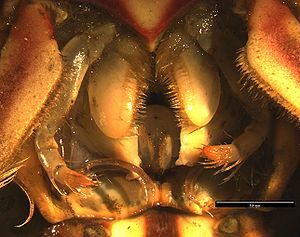 Female crabs possess four pairs of pleopods and males bear two pairs of pleopods, used as copulatory organs. Breeding in P. producta appears to occur all year round. Females appear to be consistently found in nests of interwoven kelp stipes, but it is unknown if these stripes are woven by the crabs. Females mate while they have a hard shell or exoskeleton, not right after molting. In Monterey Bay, eggs are carried for 28-31 days before hatching. Based on laboratory findings, a female can deposit a new brood of eggs within two days after the hatching of the previous brood. Females also appear to be capable of producing a new crop of offspring approximately every 30 days. The brood size can range from 34,000-84,000, with an average brood size in Puget Sound being about 61,000 for females with a carapace width between 41-56mm. Pugettia producta has not been evaluated by the International Union for Conservation of Nature (IUCN). ↑ 1.0 1.1 1.2 1.3 1.4 1.5 1.6 1.7 Garth, John, and Donald Abbott. "Brachyura: The True Crabs." INTERTIDAL INVERTEBRATES OF CALIFORNIA. Stanford, California: Stanford University Press, 1980. 592-599. Print. ↑ Kozloff, Eugene N., and Linda H. Price. "19. Phylum Arthropoda: Subphylum Crustacea: Class Alacostraca: Subclass Eucarida." Marine invertebrates of the Pacific Northwest . Seattle: University of Washington Press, 1996. 413. Print. ↑ 3.0 3.1 Kozloff, Eugene N.. "On and Around Floating Docks and Pilings." Seashore life of the northern Pacific coast: an illustrated guide to northern California, Oregon, Washington, and British Columbia. Seattle: University of Washington Press, 1993. 78. Print. ↑ Schram, Joel W.. "On the Origin of Decapoda." Decapod crustacean phylogenetics . Boca Raton: CRC Press, 2009. 3-13. Print. ↑ 6.0 6.1 6.2 Boolootian, R. A., A. C. Giese, A. Farmanfarmaian, and J. Tucker. "Reproductive Cycles of Five West Coast Crabs." Physiological Zoology Volume 32.No. 4 (1959): 213-220. JSTOR. Web. 5 Feb. 2011. ↑ Fincham, A. A., P. S. Rainbow, Richard Hartnoll, and Peter Gould. "Brachyuran life history strategies and the optimization of eff production." Aspects of Decapod Crustacean biology: the proceedings of a symposium held at the Zoological Society of London on 8th and 9th April 1987. Oxford [Oxfordshire: Published for the Zoological Society of London by Clarendon Press ;, 1988. 1-9. Print. ↑ O'Brien, Jack . "Precocious Maturity of the Majid Crab, Pugettia producta, Parasitized by the Rhizocephalan Barnacle, Heterosaccus californicus." Bio. Bull. 166 (1984): 384-395. Print. This page was last modified on 26 February 2011, at 16:18.